You’ve come to the realization that you are done renting. You hate driving through the broken gate into your apartment complex and you aren’t feeling the property management anymore? Okay that may have been my own personal struggle but I know plenty of people thinking the same. Example: You pay $1400 a month in rent. That is yearly amount of $16,800 (yes in reality that is what you are paying). Guess what? When it is tax time, you cannot write any of that off and that is just $16,800 out of your pocket for a place that you don’t own and have to ask permission to paint the wall. How fun is that? Now you’re at the point of “I want to own my home and live my life on the edge.” The scenario may not play out like that but you’re at the point where you want to own your own home. You want the granite countertops, stones on the outside of the home, inviting entry-way, and my beloved favorite: media room. You know you can get approved for a mortgage. You know you have excellent credit and a stable job. The fear is the down payment. How do I purchase my home without having the funds to do so? Don’t I need 20%? Well I am here to break down what you need and how to gain those down payment funds. How much will the downpayment be? This answer really depends on what type of mortgage loan works best for you. For a FHA loan, you will be required to put down 3.5% of the sales price. For a conventional loan, that amount would be 5%. Example: If a home is $250,000, for a FHA loan you will need a downpayment of $8,750. On that same home with a conventional loan, that the downpayment would be $12,500. Does that make you feel a little better? I don’t have that amount saved. What do I do now? Did you know that there are numerous resources to help with the downpayment. 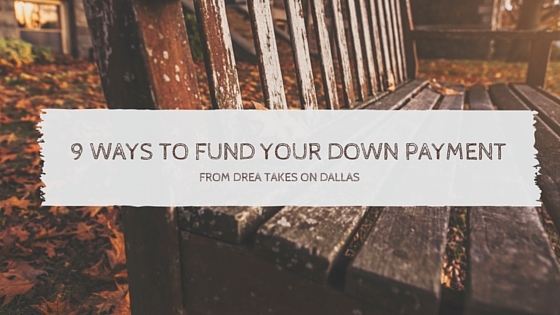 Here are 8 ways to fund your downpayment. Now you may have checked here first and realized that was the obvious first option for the downpayment but that is mostly the first start and lenders are going to want to see some savings in your account. Do you have money stashed in CDs, stocks, and bonds? These assets would help would it comes to your down payment. Majority of the major cities in the metroplex have down payment programs. The state of Texas does as well. These programs are based on your household size and income. The amount of money from these programs range from 5% of the loan price to $20,000. The city programs are based for low to moderate income families. The chart below is widely used in the Dallas, Collin, and Denton County areas. FYI – The income cannot exceed the number based on your household size. These are local income limits. The state limits are higher. Do you have a rich uncle or parents? Aunt Sue and Uncle James love you right? Butter up that loving to ask relatives for a gift fund. Your down-payment can be funded by relatives who are willing to give you funds to purchase your home with no strings attached. It has to feel good to come from such a loving family right? Go ahead and give Uncle James a call right now. If you have served our country, you are due to a special treat when it comes to homebuying. You will be able to qualify for a 100% financing loan. This means no down payment and low interest rates. You may not be a veteran but you don’t mind living in a rural area to have 100% financing. Then you may be eligible for a USDA loan. This loan has income restrictions too. USDA loans are restricted to rural areas BUT areas such as Little Elm, Aubrey, Cross Roads, Oak Point, Prosper, and Celina are eligible for 100% financing. These areas are quickly growing in the metroplex. Below is the income limit for USDA Loans in the metroplex. The limits are based on household size in each column. Column one is for a one person household and so on until an 8 person household size. You can also get a part time job to help secure your down payment. We could all use some extra income to satisfy our needs so why not apply for a job to help secure those extra funds Uncle James couldn’t give. With new sites and apps, you’re able to sell things quickly and shortly to secure some cash. Sites like OfferUp, Ebay, and Craiglist are all valuable to sell things that you could give up to secure a few more dollars. These are just the steps to fund your down payment to becoming a homeowner. As always, I’m #CrowningHomeowners and this is my Tuesday Tip.